New look here! I’m hopeful you’ll be posting more regularly… though school comes first, of course, young lady! Thanks, Mom! I plan to post every weekday, come rain, snow, or Organic Chemistry midterms. Keep your boys away from WoW as long as you can. Role playing games are the most addictive kind, and WoW is one of the worst in that category. And by the way…. I ‘m a boy….! Noooo! Such a faux-pas!!! I’m very sorry! The perfume community is pretty heavily weighted towards the ladies, leading me to make very faulty assumptions. It wasn’t a faux-pas. No reason to be sorry. I just wanted to put my reviews and comments in the right perspective. 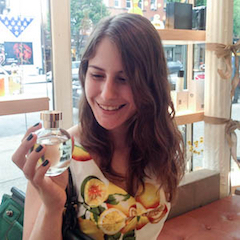 It is true that the perfume blogging community is predominantly women dominated, especially in the US. Strangely enough though the basenotes male forum is a lot more active than the female. So I guess women blog more while men chat! I have a special section on my blog roll about men on perfume, not because I do not appreciate the female point of view, but exactly because most people expect perfume bloggers to be women. You pervert you! 🙂 I was a very precocious child (or a very obnoxious child, depending on who you asked). Oh my god. See, this is why I wanted to share you— because every time I come over here, I nearly pee myself (old age, weak bladder) laughing, and the more people who can share in that kind of joy, the closer we’ll get to world peace. My fiance’ actually likes L’Heure Bleue. Probably more so than even I do. He’s always trying to get me to wear it when I’m indecisive, so … yay to having men w/ good taste in pefume. Thank you very much, K! How lucky for us 🙂 If it’s not too bold, I think L’Heure Bleue would make a great wedding perfume… Have you tried Apres L’Ondee? If you like L’Heure Bleue at all, I think it’s a must-try. Maybe you will prefer it!